With so much interest in Disney Epic Mickey it's no surprise Disney wants to offer fans something more than the standard vanilla release, which is why it's put together a Collector's Edition for the forthcoming mouse outing. Inside the special packaging sits a 5" vinyl figure of Mickey wielding his paintbrush, as well as a DVD featuring behind-the-scenes footage and unseen artwork. Rounding out the package is a Wii Remote "faceplate", which is more likely a vinyl sticker, and two Wii console skins. 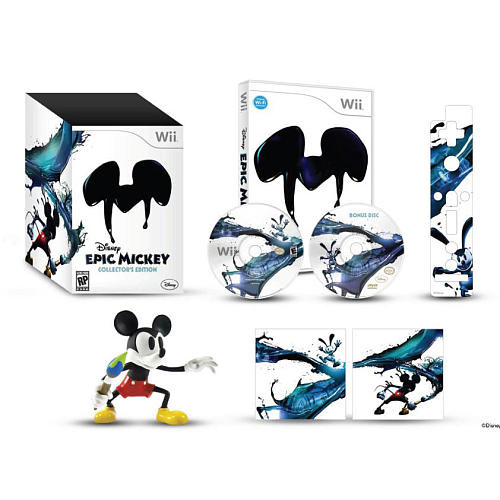 You can lay $69.99 down on the Disney Epic Mickey Collector's Edition at Toys 'R' Us, but no European equivalent is currently confirmed. Credit to reader Nero for the tip. I was hoping they'd make an Epic Mickey paintball gun. I don't know why they call these "collector's editions" - they should call them "future ebay extortion editions". I'm not caught in the Epic Mickey hype, so I'm going to be avoiding the release altogether. Besides, I need to save my money for the Halo Reach Legendary edition. Looks awesome! I might buy it. Anyway, not fussed about the shiz but I need that faceplate sticker thingy! Oooh Machu has got teh eyes of magic or sumfin! Wi-fi lolwut? I thought tis said facepalm. GameStop has this listed as well, in case anyone cares. I'm not sure the content in this box sounds worth a $20 premium. I think more publishers need to be willing to put the $10 premium on their collector's editions. I might go for it, but I've got a lot of other games to get as well including the collector's edition of LBP 2, so I'm not sure I'll have that much extra to spend. Yeah I'm not interested in special editions of games because I buy the game for the game and because I want to play it and not because it has a cool figure or whatever. I do like companies who adds good stuff as a "thanks" for no charge (see the PC game Witcher: Enhanced Edition) since these are things that makes me wanna continue supporting good companies. How much just for the game and the DVD? For a DVD, a sticker, and 2 jackets, I might as well skip this one. The stickers I can do without but the DVD and the figurine are worth the extra $20. I'll be getting this. Sweet. I'm getting this during Christmas, for sure! So is this Toys R Us exclusive or does Game Stop/EB Games have the same deal? @Chrono Cross: I already answered that question in post #9. Going straight on my Christmas list, yay. Looks cool, I'll consider it. This game is going to disappoint. Not much of a special edition, in my opinion. The figure is nice but I would much rather have a nice premium artbook instead of some useless skins. I just saw the screenshots of the game at the bottom of this article and they just blew my mind. The graphics in this game look absolutely incredible! I really hope that the game plays as good as it looks. Frankly, I think this "Collector's Edition" is as poor as it gets. As the post above said: There isn't much to collect in it aside maybe from the figure (collecting figures is one thing I cannot understand, except for tabletop miniatures, of course ). "Special Edition DVD with behind the scenes footage and additional marketing assets and videos". "Camera tour of Junction Point Studious and previously released Interviews with Warren Spector. Also: a handful of wallpapers and all previously released trailers." Somehow I fear, I'm not that much off the mark. In German, this is a "Bauernfänger". So long as the game delivers, I'm happy though. I'm thinking about getting this. I love special editions. I'm a sucker for collectibles. I wonder what wi-fi features it will have? I can't really see what wi-fi features would really fit into a game like that but it clearly has the wifi sign on it. Aaaaand Disney has just decided to take 70 of my dollars come release day instead of 50. That's alright - Epic Mickey looks amazing! I just hope they advertise it well so it does pretty good. They did a great job advertising Split/Second and Toy Story 3...but then again, Guilty Party (which looks pretty rad; go check out Giant Bomb's Quick Look for the title) is coming out THIS WEEK and I haven't seen so much as a web banner for it anywhere, let alone a tv commercial.